We’re really excited about endodontics here at Patterson. So excited that I wanted to share what my ideal endo tray setup would look like. 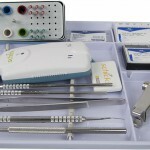 Here’s what our endo tray looks like. These are fundamental needs for endo procedures, and you can save on these basic supplies with Patterson private label products, like the ones on my tray. What does yours look like? See your patient’s mouth clearly! These rhodium-coated, front surface mirrors reflect a true, nondistorted image without shadows. Serrated tip allows for a better hold and the heat-treated stainless steel prevents bending and misalignment. Great for irrigating the canals. This new capsule delivery form eliminates room for error by removing the need to measure and mix. Our stainless steel hand files are color coded by diameter and designed with a high torsion strength to prevent breakage within the canal. The guesswork stops here. Our endo stops are ISO color coordinated to match our endo files and conveniently sold in assorted packs. Get right to the point and absorb fluids. This one’s just fun to say. Also, color coded to match our endo files and radiopaque so it can be seen on an X-ray. Get hooked on this explorer. Our spreaders and pluggers go hand-in-hand for condensing your gutta percha. Only through Patterson can you get this digital imaging system. Done chairside, this system saves your office serious time and effort. Does sybron make such a tray for their set up?